So we had a GREAT weekend in Philly. We went there to see the King Tut exhibition. I had been wanting to see it since it was in Chicago, so when it came to Philly, we made a trip of it and met our friends there. 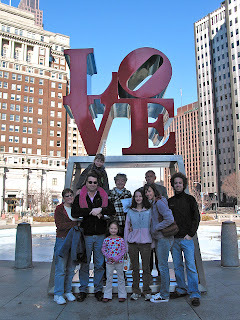 Here we are hanging out at the famous LOVE statue!!! And King Tut was awesome--- beautiful and amazing artifacts!! WOW!!! And the food in Philly was fabulous! And... of course we saw the liberty bell- all in a short weekend!!! The question of the day is...did you make it to Pat's for a cheesesteak? Yummy!